Leds or Light Emitting Diodes are in almost every appliance you see. Does your dishwasher have a green light when it is on? That is an led. 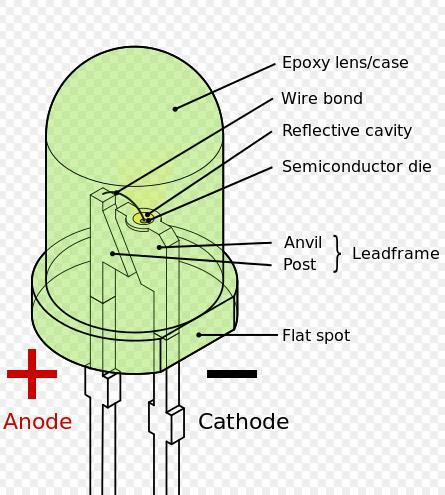 Below is an anatomy of an led from Wikipedia. Notice the led has a positive side and a negative side. 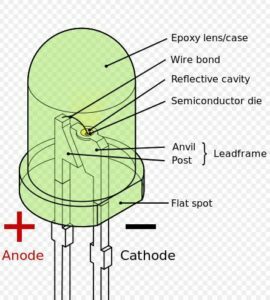 The cathode or negative lead will always be shorter than the anode or positive side. 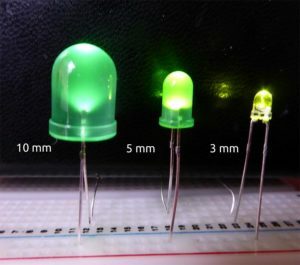 But what kind of leds are right for my DIY project? Well, that depends as leds come in a variety of sizes, colors and brightness. Some common led sizes are smd or surface mount, 3mm, 5mm, 10mm. The most common size for hobbyists is probably 5mm. These are all what we call through hole components. They can come even smaller as SMD or surface mount components. 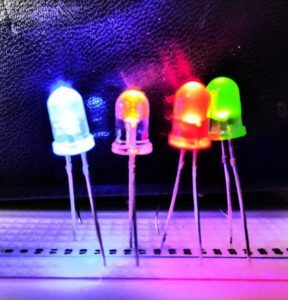 Leds come in a variety of colors like blue, yellow, red, green. Most leds have only one color but you can get bi-color leds and RGB leds. See our other post RGB LED. Led brightness is measured in millicandela or MCD for short. Leds can range anywhere from 50 mcd all the way to 15,000 mcd for “super bright” leds or even higher. Forward voltage is the amount of voltage a led requires before it will turn on. Many 5mm leds have a forward voltage of 1.8 – 2.2 volts. 5mm leds generally have a forward current of 20 mA. mA stands for milliamps or millionths of an amp. Knowing this, the voltage supply and the forward voltage, we can calculate what resistor to use with the led. If we take an led with a forward voltage of 2 and a current of 20 mA what resistor should we use with it? If we have a power supply of 5 volts then subtract the forward voltage of 2 we get 3. 3 divided by 20 = .15 or 150 ohms So we need a 150 ohm resistor. Most leds you will use will probably need a resistor in the 100 – 500 ohm range. You can also use Ohm’s Law Calculator. But why do we need to use a resistor with an led? Think of it as an insurance policy. All power supplies are not the same. LiPo batteries at a full charge are usually over what they are rated. For example a 3.7v LiPo battery when fully charged could go as high as 4.2 volts. Get enough unwanted extra voltage across the led and you will be smelling smoke. This picture illustrates the viewing angle of an led. Keep in mind that the smaller a viewing angle, the brighter the led will be. We didn’t cover smd or surface mount leds or led strips in this but start with some 5mm leds and a 150 ohm resistor and play around. Try different resistors and watch the led get dimmer or brighter. Here is a good starter pack with 200 leds. They come in 3mm and 5mm sizes, have 5 different colors and a forward voltage of 20 mA. Mimgo Store 200Pcs 3mm 5mm LED Light Emitting Diode Lamp Diffused Assorted Kit ( White Yellow Red Blue Green ).